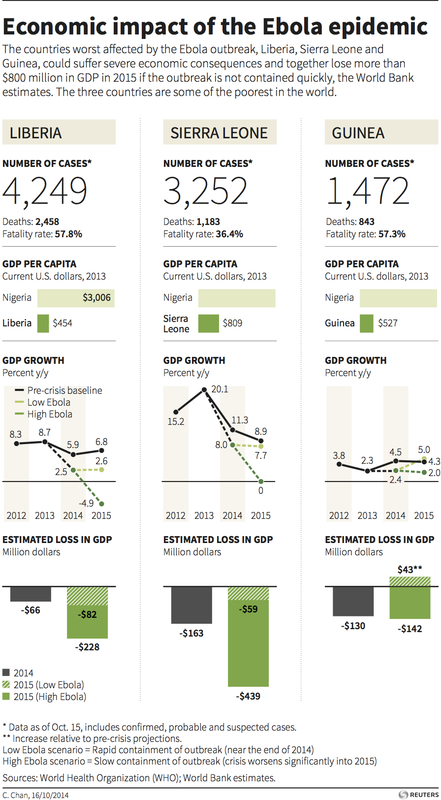 Economic Risk and Impact Analysis: The Socio-Economic Effects of the Ebola Outbreak on the Liberian, Sierra Leonean, Guinean and Global Economies. Through its adverse effects on public revenue and spending, Ebola is putting the budget under heavy pressure, substantially widening the fiscal deficit. Public Finance: The outbreak entails lowered revenues and increased expenditure, especially in the health sector, putting extra pressure on fiscal balances and weakening the state’s capacity to contain the disease and to buttress the economy via, say, fiscal stimulus. The three countries have resorted to external support to bridge the financing gap. Public Revenue: The fall in public revenue may amount to tens of millions of dollars—a non-negligible proportion of gross domestic product (GDP) for three small economies. This reduction stems from slower economic activity and a contraction of the tax base in most sectors, notably industry and services. To that may be added weaker tax administration, so that fewer taxes are collected on income, companies, goods and services and international trade, as well as fewer royalties collected on the dominant natural resource activities. Public Spending: On the other side of the coin, the crisis triggered by the epidemic calls for heavy public spending on health to contain the disease, while social protection needs grow quickly. Other non-health expenditure may also emerge, e.g. relating to security and food imports. Investment, Savings and Private Consumption: In the face of lowered public revenue and increased outlays, the crisis may divert public spending from investments in physical and human capital to health and other social expenditure. Foreign and domestic private investment is also declining in the short term, often out of alarmism prompted by the disease. Authorities in all three countries have reported postponed or suspended investment in major projects. Labour Supply and Productivity: The crisis has cut the labour supply (including expatriates), potentially lowering the quantity and quality of goods and services, especially public services. Ebola-related mortality and morbidity have cut the number of farmers available to work in agriculture and taken an extremely heavy toll on health workers. Inflation, Money and Exchange Rates: Inflationary pressures are mounting as the crisis spreads, undermining competitiveness for businesses and traders and reducing households’ purchasing power. External assets have been substantially reduced and local currencies depreciated as foreign trade tumbles and demand rises for dollars. Countries’ currency reserves have also been hit. Unemployment and commercial closures have risen: Many businesses or branches are shutting every week, and even those staying open have cut staff or reduced working hours. The largest proportion of the population exposed consists of rural families who depend on subsistence farming. Such people seldom have much stock to fall back on and have seen most of their savings eroded. And as markets have closed for weeks and economic activity has contracted, producers of perishable products cannot sell their produce, affecting household security, particularly in border areas. The crisis is leaving behind a growing number of orphans, who will require targeted support—both them and the families looking after them. Finally, stigma is growing inside countries, and those saving lives are the most affected: doctors and health workers are being treated by the population as potential vectors of infection, making it hard for them and their families to lead anything approaching a normal life. Humanitarian support: Such as desperately needed personal protective equipment and hazard pay for health workers, emergency treatment units, standardized and universally applied protocols for care, etc. Fiscal support: The fiscal gap, just for 2014, is estimated at around $290 million. Increased injections of external support can strengthen growth in these fragile economies. Screening facilities at airports and seaports: Policies are required that will enable the flow of relief and encourage commercial exchange with the affected countries. Strengthening the surveillance, detection, and treatment capacity of African health systems: Weak health sectors in Africa are a threat not only to their own citizens but also to their trading partners and the world at large. The enormous economic cost of the current outbreak could be avoided by prudent ongoing investment in health system strengthening.